When Kay Lynn Sheppard sent me the extracted Currituck court notes, I found four records that spoke directly to an Indian Town or Indian line. 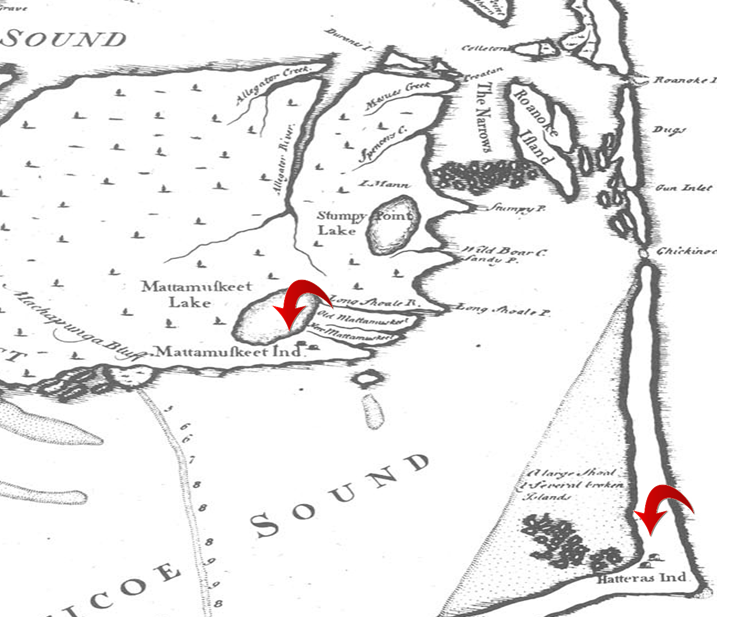 5 Mar 1778 – John Standley of Currituck County enters 100 acres. Borders on the east side of Richard Standley’s land, on James Dary’s land, widow Fenton’s land, & on the Indian line. Ordered for survey. 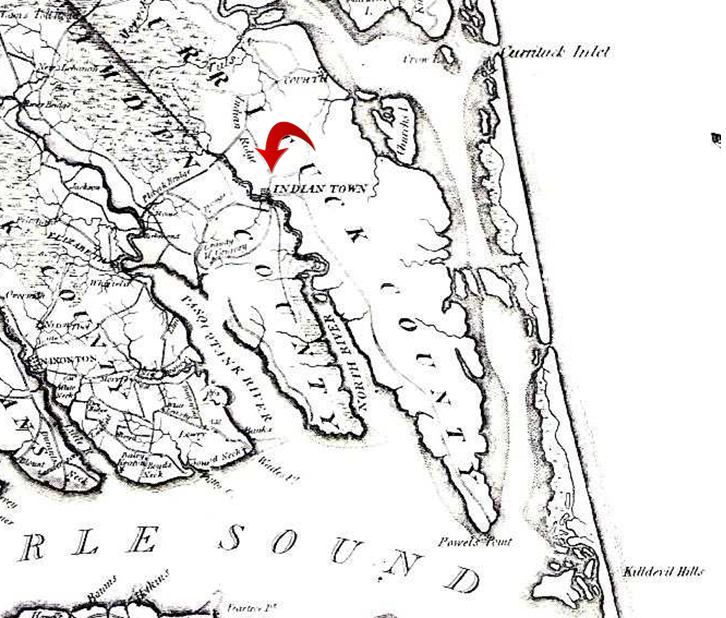 31 Dec 1778 – Robert Barnit of Currituck County enters 100 acres bordering the SW side of said Barnit’s land, North River on the South, the Indian line on the South & East, & Hugh’s place. /s/ Jas. Ryan, E.T. 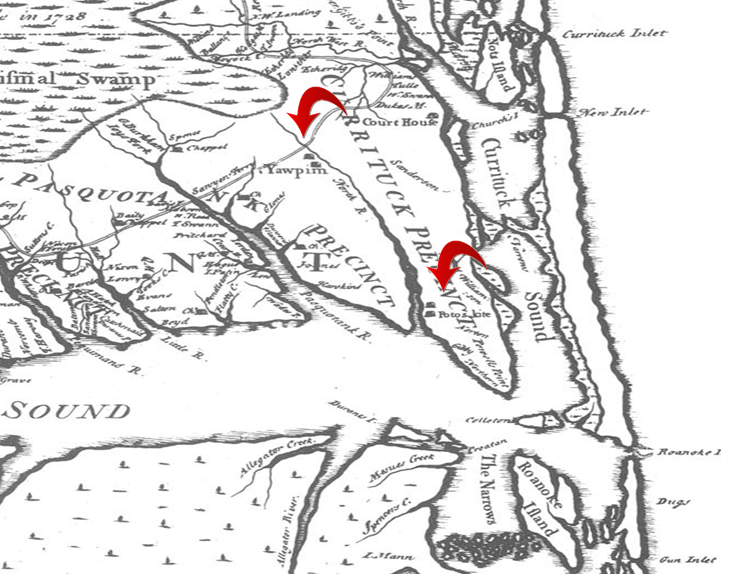 14 Oct 1784 – Mr. Samuel Ferebee enters 250 acres of land & swamp in Currituck County near the Great Swamp Road from Indian Town to Coenjock Bay, which swamp leads from North River and borders a corner in Francis Williamson’s patent. Ordered for survey. /s/ John Simmons, E.T. Of course, I wanted to know where this Indian Town was located. Kay Lynn was most helpful there as well, locating it on two old maps. On the 1808 Price-Strothers map, you can see it listed as Indian Town. On the earlier, 1733 Mosley map, it’s actually called Yawpim, reflecting the name of the tribe whose village and reservation were located there. It’s worth noting on this map that the Poteskite Indians are also shown not far from the Yawpim, as are the Mattamuskeet and the Hatteras on the south side of Albemarle Sound. This land for the Yawpim Indians was set forth as a reservation in 1704. Att a Councill held att the House of Captn John Heckleford in Little River Aprill ye 12th 1704. Prsent the Lords Deputyes. This was followed on the next two pages by a very similar order for the Chowan Indians. This “History of Indian Town” tells us a little more. As with many other early towns created in North Carolina, there simply isn’t much information currently available regarding the village of Indian Town, first within Currituck County, then because of minor boundary changes it ended up in Camden County. One can easily find its location on many maps that were produced in the 1790s and well into the late 1800s, but one cannot find much else out about this town. Indian Town was located well up the North River – about halfway up the border between Currituck and Camden County – a tad north of what is now the town of Camden (on the east side of Camden County), and a bit south of the town of Currituck (on the other side of the county from Indian Town). US Postal records provide us a little insight. Indian Town was granted a Post Office on August 10, 1793 and its first Postmaster was Mr. Thomas P. Williams of Currituck County. On February 1, 1882, the Post Office records indicate that Indian Town was moved to Camden County, and its first Postmaster in that county was Mr. Samuel S. Leary. This PO was in continuous operations until May 15, 1934, when it was closed for good. This entry was posted in Hatteras, Maps, Mattamuskeet, Poteskeet, Yeopim. Bookmark the permalink.